When your body is on a regular menstrual cycle, it's easy to tell when you're fertile and when you should expect your period. But when you have irregular menstrual cycles, your fertile period can be different each month. This fertile time, centering around ovulation, gives off some tell-tale signs. If you know what to look for in your body, you'll be able to track down your ovulation each month and predict the best times to conceive. Use your calendar to record cycle data. The longer you record your data, the more evident patterns may be. For example, you may find you get your period regularly every 45 days or every other month. The longer you record your cycle data, the better a picture you will have not only to help identify ovulation, but to present to a medical professional in the future, if need be. Monitor your cervical mucous and record it on your calendar. Cervical mucous is your regular, healthy discharge. Your cervical mucous changes throughout key points in your cycle, according to the American Pregnancy Association, and can be a good indicator of ovulation. After your menstrual cycle, you'll notice a few days of no mucous, then your mucous will get more abundant and more wet as you near ovulation. During ovulation, it is referred to as "egg white mucous" because it's clear, thick and stretchy like egg whites. According to the American Pregnancy Association, your ovulation day is marked by the "clearest, slippery and most stretchy" mucous. Take your basal body temperature. Your normal body temperature spikes by one-tenth to one-half of a degree when you ovulate, according to Planned Parenthood. To measure this, you need a digital basal body temperature thermometer. These thermometers are able to calculate specific temperatures to the tenth of a degree or greater. You must take your temperature first thing in the morning each day before you do anything else, including getting out of bed, because even the slightest activity can raise your temperature. 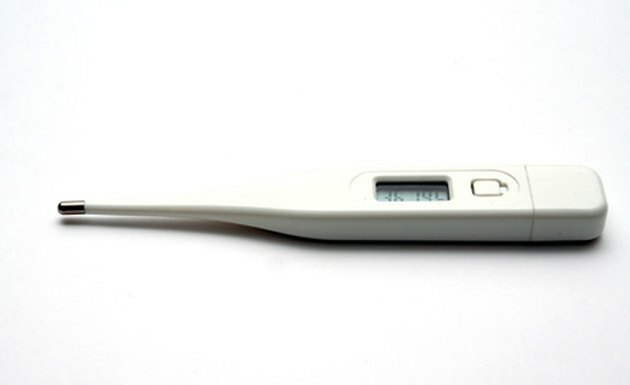 Record your temperature each day and look for the spike to indicate ovulation. Test your urine for signs of ovulation. Commercial ovulation test kits check for hormones that are more abundantly present in your urine when you are ovulating. You can also purchase a fertility monitor, which is a small machine that collects your urine on a regular basis to determine when you're ovulating based on your hormonal levels. Have regular blood tests by your doctor to determine if you're ovulating. Your doctor can prescribe blood tests that will determine hormone function and levels at different times in your cycle. These tests can help determine if you're ovulating and when, and they are especially useful for women who are trying to conceive. You doctor may also be able to perform tests on your ovaries and reproductive system to help determine ovulation.